"The Whiskey Without an Ache or Pain"
A while back a friend of mine gave this to me as a thank you for cleaning a couple of bottles. It is (or was) silver plate over some sort of base metal. It has a neat form and my first inclination was that it was eastern. 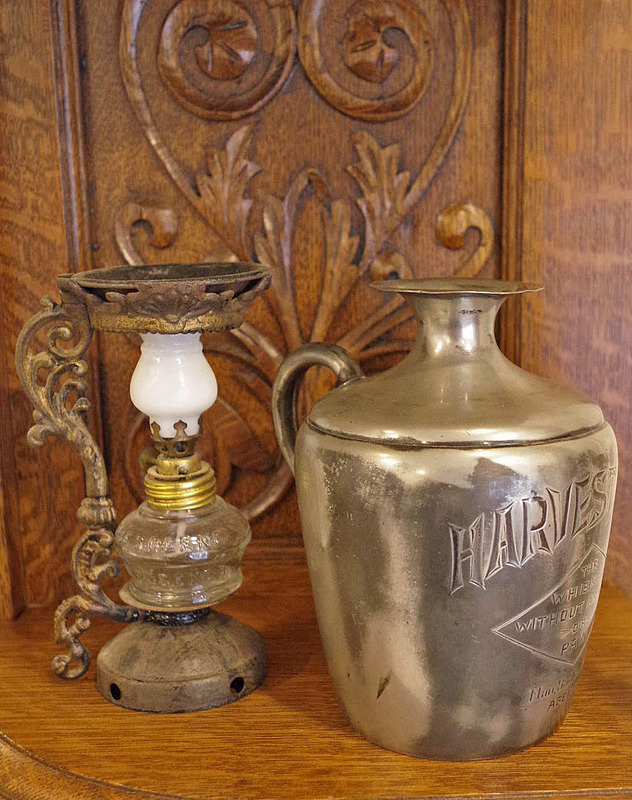 I thought it would look good next to the Vapo-Cresolene lamp on the antique oak Victorian mantle surround in my great room. I was right. And it fits nicely with the two Rayo kerosene lamps that have similar finishes which are located above. While dusting the mantle today, I got to looking closer at the pitcher. Obviously, it was meant to advertise the product. What was it intended for? Was it for dispensing whiskey? Or maybe for water, to mix with whiskey? And, was it really eastern? 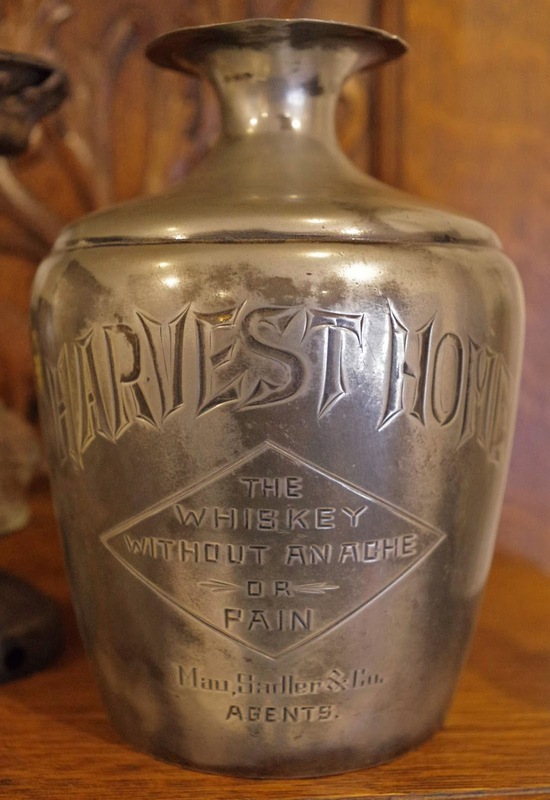 I seemed to recall seeing the engraving pattern on the pitcher somewhere, sometime in the past. But where? 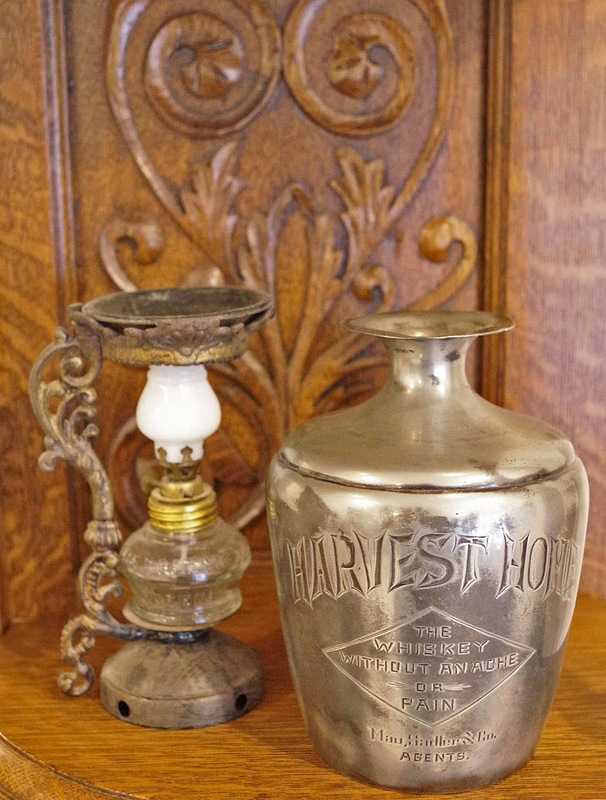 A search online revealed that "Harvest Home" was sold by Hayner Distilling of Dayton Ohio and "Harvest Home Rye" was sold by S. Altschul Co. of Springfield, OH. OK, so it's eastern. Or was it? The engraving near the base lists an outfit by the name of "Mau, Sadler & Co. / Agents". Sure enough, a search of the S. F. Cal. Crocker directories, starting in 1888, showed Mau, Sadler & Co. as being wholesale grocers located at 9-15 Beale St. This was the only advertising that I could locate for the firm. 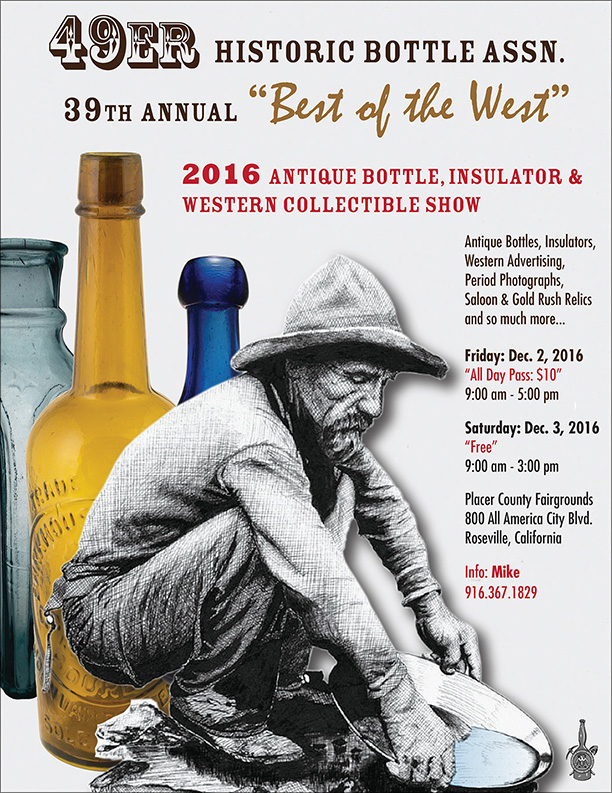 It appeared during the winter of 1889 in the Daily Alta California. 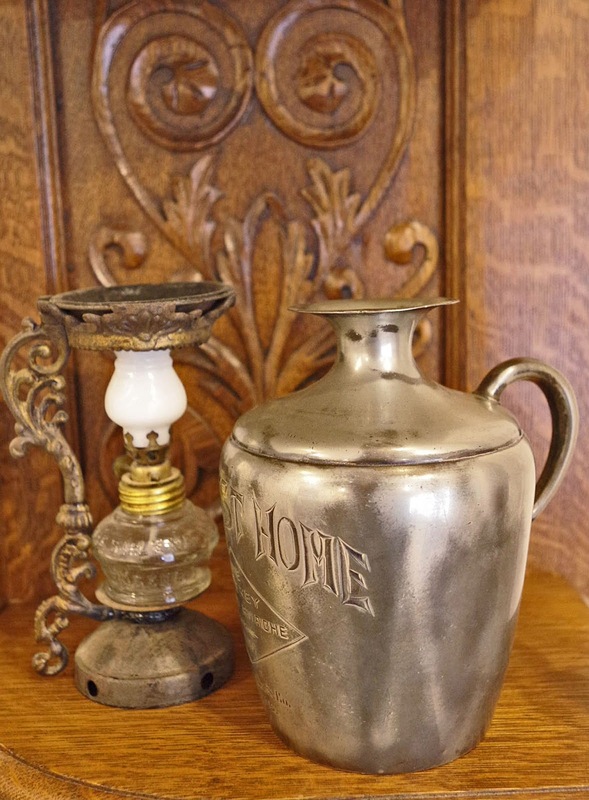 Their listing in the 1889 directory had grown substantially, as had the array of products that they were offering for sale. Things stayed the course through 1894. By 1895 they had really hit their stride, had closed the Beale St. location and opened two more; one at 122-124 Market St. and the other at 19-21 California St. Reference to the "fancy goods" disappeared and it looks like they were going for quantity instead of quality. By now, they also had a telephone number listed. 1897 saw their focus change and they were now claiming to be manufacturers and jobbers of cigars, coffee, tea and food products. By 1899 their listing in the directory had shrunk drastically, and the California Street location disappeared. The last reference to Mau, Sadler & Co, was in the 1901 directory, in the smallest of type, and in less than a single line, they were listed simply as "whol. grocers" at 122 Market. By 1902, they were gone for good. After coming up with the west coast connection, I recalled where I'd seen the pattern. 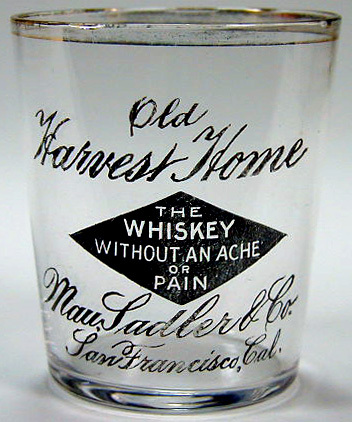 It was on an incredibly rare rubber stenciled / black print advertising shot glass in the Schwartz collection. Sure enough, the photo was on my external backup drive. Odd... in all of the listings and newspaper articles that appeared from 1888 through 1901, not once do they advertise the fact that they were retailing whiskey. And yet, thanks to a shot glass and an oddball pitcher, we can document yet another obscure "western" whiskey. My guess is that both the pitcher and the shot date to ca. early to mid 1890's. Anyone out there have an embossed Harvest Home / Mau, Sadler & Co. cylinder or flask?????? Thanks for Robin P. for the photo of Kens shot glass. Just got my old pal John Ronald's for sale list. He's got a couple of seldom seen Cutters available. They sound like they're top shelf. Louisville, KY / A.P. Hotalings O.K., Cutter Whisky (back), B237, 11 7/8"
light amber cylinder fifth, applied long tapered lip with ring, mint. I can attest to his honesty and integrity. A really great guy and an asset to the hobby! If you're interested, drop him an email.